Tall spires of pink flowers with a white bee. Genetically dwarf like Delphina Dark Blue but with rose-pink flowers and white centers instead, blooms will start to spike in June through August, will rebloom with dead heading. These tall, stately perennials are an old-time favorite but are relatively short-lived. Most prefer cooler climates and well-drained soils. 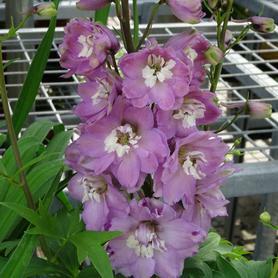 Delphiniums are also heavy feeders and benefit from the addition of humus to the soil. Plants bloom early summer. Taller types have hollow stems and may require staking to protect from wind and rain. Plant near the back of the border.